Octopus Spring is an alkaline hot spring in the Lower Geyser Basin of Yellowstone National Park. Its drainage channels radiate like arms of an octopus, hence its name. Water flows from the source at about 95 degrees C to outflow channels where it cools to a low of about 83C. A steady discharge, estimated at 75 to 100 gallons per minute, feeds the extensive and colorful microbial mats. Pink filamentous communities appear in the channels about 2 meters from the crystal blue pool. Continuing down the channels, temperatures decrease and microbial mat communities change, both in color and composition. A diverse array of microbes comprise the hot spring mats of Octopus Spring, including cyanobacteria, green sulfur bacteria, and green non-sulfur bacteria. Octopus Spring is about 95 degrees C at the source. 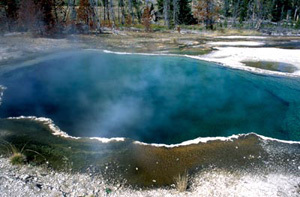 As the water flows away from the main spring, it cools to about 83 degrees C and supports the growth of a variety of thermophiles, including Aquifex and Thermotoga. For additional resources about Octopus Spring, search the Microbial Life collection.